Eco-efficiency is all about doing more with less and includes reducing energy use, waste, raw material and transport. These sorts of initiatives lower costs, and in turn help to boost profits. There is a growing demand among consumers for more sustainable products. People are more concerned than ever about ethical trade and are prepared to pay more for Fairtrade or organic products. Service-focused business models are beginning to emerge. Just look at Rolls Royce – it doesn’t sell jet engines to airlines anymore, rather it leases them on an ‘air-time’ basis. The customer benefits from fixed costs and a lower initial outlay, Rolls Royce has a regular and long term income stream, and because the product is designed for a long life, it has a lower environmental impact. Sustainable practices can lead to improved staff morale, and this motivation increases productivity. Being environmentally conscious and more sustainable is good for your brand. Business-to-Business (B2B) SMEs can gain ‘preferred supplier status’ by demonstrating their sustainability credentials. In some cases, larger companies that source products from SMEs are asking for evidence of sustainable business practices. If a business goes above and beyond the requirements of environmental legislation, there is a lower risk of being fined for non-compliance, a better chance you’ll enjoy good relationships with local authorities and regulators, and also a higher likelihood that you’ll find it easier to adapt as requirements become more stringent. Sustainability is the new ‘Mega Trend’. Being transparent about business practices now can be an advantage later, as it future-proofs your business for when it becomes a requirement. 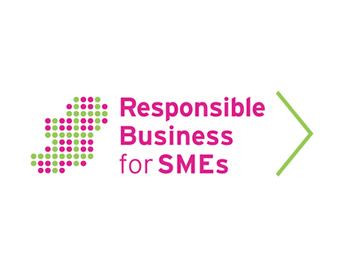 SMEs should join networks to share and gain knowledge with their peers on sustainability. Being part of a network can have the added benefit of reduced fees from other members, and perhaps be eligible for awards for good practice (e.g. Chambers CSR awards, SMILE Resource Exchange). And finally – these practices are good for the environment and society! As SMEs make up 99% of all businesses, so the cumulative effect of small changes in SMEs can make a real difference to the places we live in.